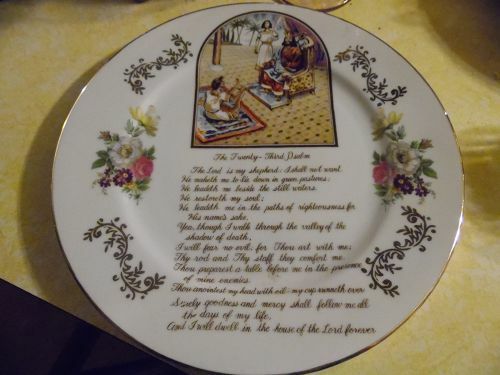 Old Vintage Twenty-Third Psalm Collectors Plate with Gold Trim and lovely flowers embellishments. Approx. 10-1/4" Diameter. Original sticker and in perfect condition. Would make a lovely gift. 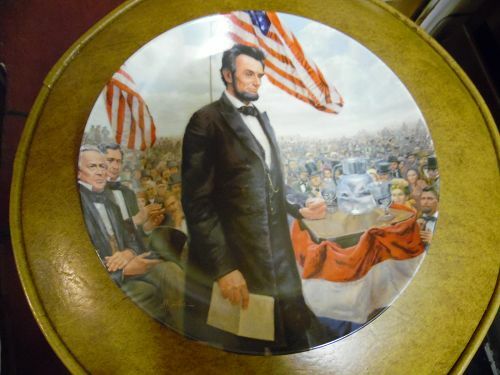 The Gettysburg Address Limited Edition Collector Plate First issue in Lincoln, Man of America, a limited edition series by Mort Kunstler. Edwin M Knowles China. Circa 1986. About 8 1/2" diameter. Excellent pre-owned condition with not chips, cracks, scratches or repairs. Includes COA paperwork and original box. Limited numbered edition collectors plate. 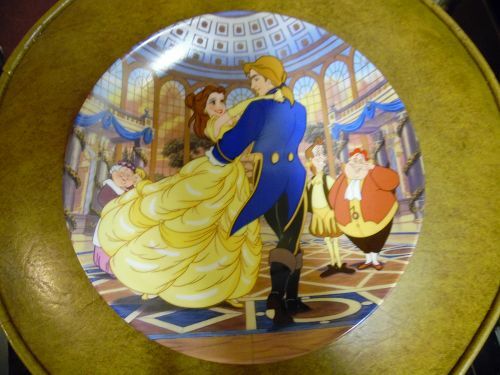 Disney Beauty and the Beast "The Spell is Broken" 12th (last) plate in the Beauty and The Beast Plate collection. Plate is brand new and has COA and accompanying paperwork, Styro box is in bad condition. From the Coral Kingdoms Collection, titled Moonlight Discovery by Anthony Casay. 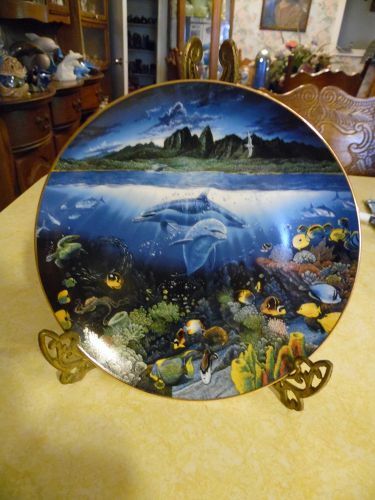 This hand numbered collector plate from the Crestly Collection, features a reef scene with one dolphin swimming in an reef underwater and the other breaching the water. A beautiful ocean scene with towering rocky cliffs. Plate in perfect condition with a diameter of 7 3/4". No box or paperwork. 1991 Hamilton Great Mammals of the Sea collection by Wyland. 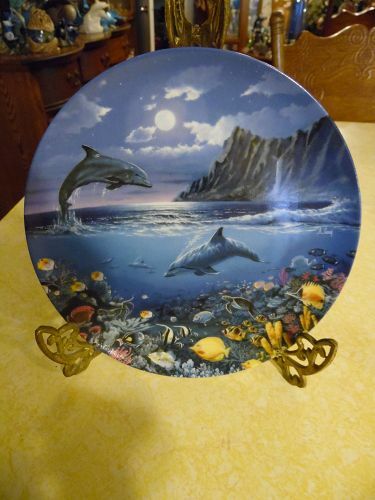 This plate titled HAWAII DOLPHINS. Limited Edition Plate (14 firing days). 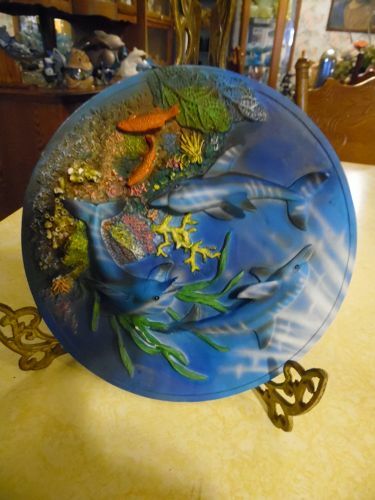 Four beautiful dolphins is an underwater and ocean level scene - about 8 1/2" diameter. I do not have the original shipping box or certificate. Excellent condition with No chips cracks or breaks. 'Orca'From the Whale Conservation Plate Collection. Pacific Whale Foundation By Lenox. Original Series, 1993. Plate is 8.5" in diameter and rimmed with a gold border. Made in the USA. Excellent Condition. No box or paperwork. 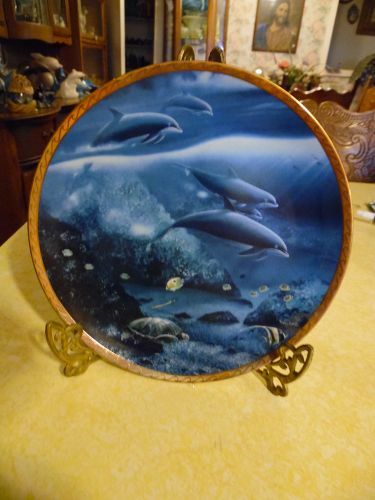 Sanctuary Of The Dolphin Collector Plate, from the Enchanted Seascapes Plate Collection by John Enright. Hamilton Collection ~ ©1993. About 8 1/4" in diameter Nice condition with no chips, cracks, or repairs. Hand numbered limited edition. No box or paperwork included. Beautiful ocean themed collectible. 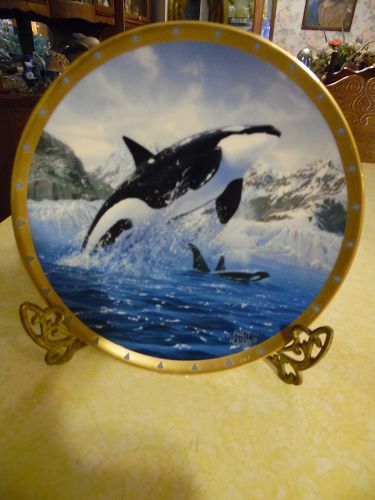 Dolphin Plate by Danbury Mint. A Discovery Off Anahola By Robert Lyn Nelson from the Underwater Paradise series. Measures 8 1/2" diameter. Perfect condition but no box or certificate. Hand numbered collector plate limited to 75 firing days.1991. Limited edition collector plate was limited to members of the Calhoun's Collectors Society in 1979. 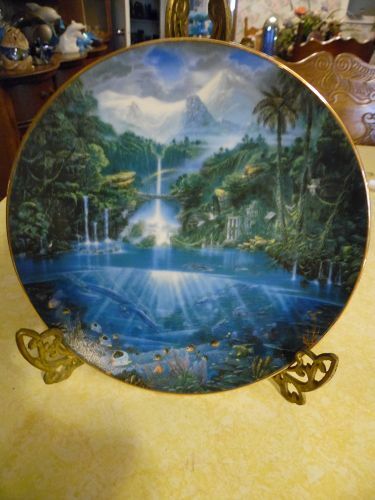 Plate is from an original painting by artist Dominic John Mingolla. Measures 8 1/2" in diameter, gold trim and hand numbered and signed by the artist. Previous owner has purchased the nice wood frame that nicely enhances the plates beauty, and that is included as a bonus. Comes in the original box with certificate of authenticity. Perfect condition. 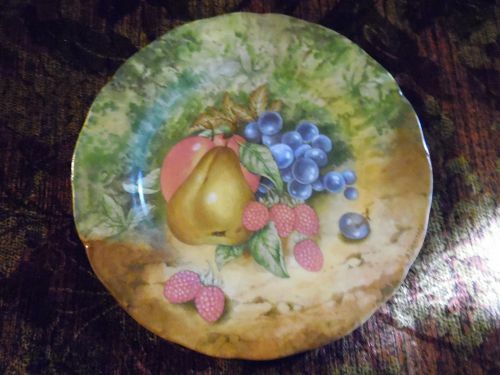 Beautiful 7 3/4" plate decorated lavishly with a pear, apple, rasberries, and grapes. Plate is made by Haas Czjzek In the Czech Republic. Plate has a stamp over this stamp, PEWTINA Design Hand decorated Auburn CA. Plate is in pristine condition. I have another being listed that is similar but different fruit. See my catalog. 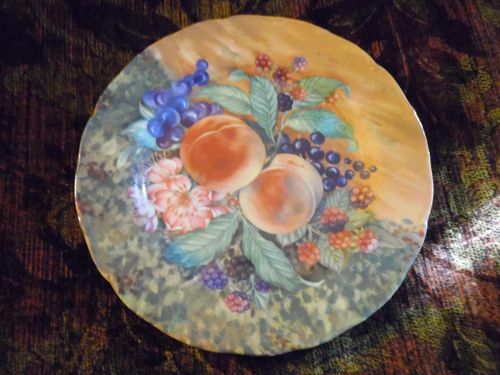 Beautiful 7 3/4" plate decorated lavishly with peaches berries, grapes and peach blossoms. Plate is made by Haas Czjzek In the Czech Republic. Plate has a stamp over this stamp, PEWTINA Design Hand decorated Auburn CA. Plate is in pristine condition. I have another being listed that is similar but different fruit. See my catalog. Limited edition plate from the Danbury mint Hand numbered and signed by the artist, John Silver. 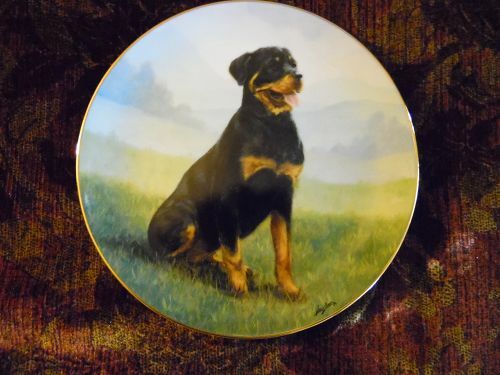 From the collection titled Rottweilers, this plate is titled At Attention. Plate measures 8 1/4" and has gold trim. Perfect condition but there is no paperwork or box. Limited edition plate from the Danbury mint Hand numbered and signed by the artist, John Silver. 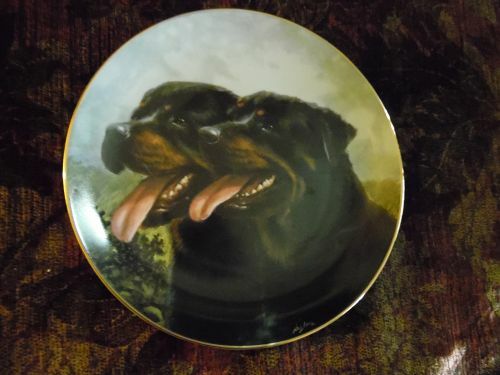 From the collection titled Rottweilers, this plate is titled Dynamic Duo. Plate measures 8 1/4" and has gold trim. Perfect condition but there is no paperwork or box. Limited edition plate from the Danbury mint Hand numbered and signed by the artist, John Silver. 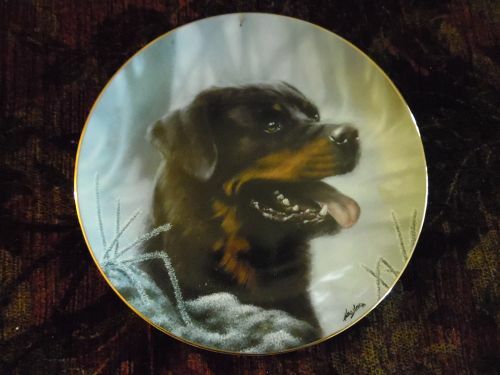 From the collection titled Rottweilers, this plate is titled Frosty Morning. Plate measures 8 1/4" and has gold trim. Perfect condition but there is no paperwork or box. Limited edition plate from the Danbury mint Hand numbered and signed by the artist, John Silver. 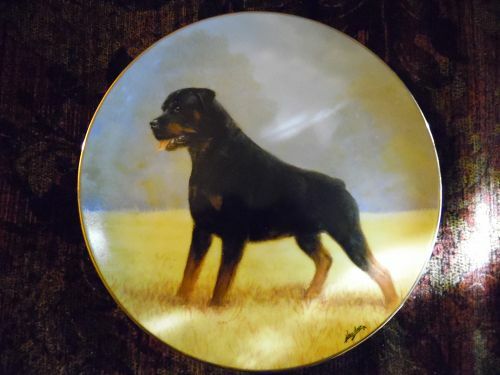 From the collection titled Rottweilers, this plate is titled Noble Companion. Plate measures 8 1/4" and has gold trim. Perfect condition but there is no paperwork or box. 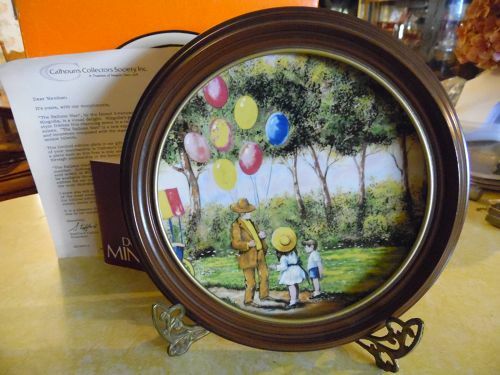 Limited edition plate from the Danbury mint Hand numbered and signed by the artist, John Silver. 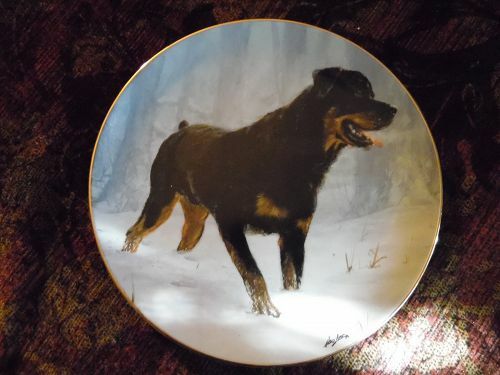 From the collection titled Rottweilers, this plate is titled Winter Walk. Plate measures 8 1/4" and has gold trim. Perfect condition but there is no paperwork or box. 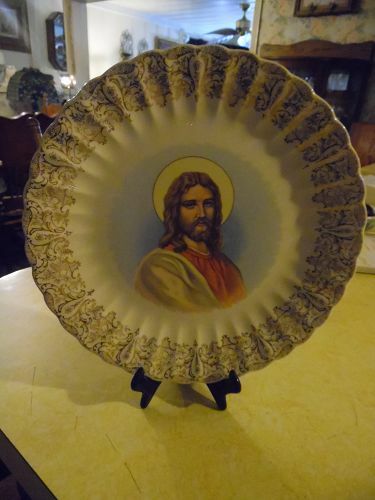 10" Diameter Sander's MFG Nashville, Tennessee decorative religious plate of Jesus. Not marked. "Inspiration",23 k gold filigree design trim & decorates edges of plate. Perfect condition with no chips or cracks and gold is very nice.